SHE'S A STAR DIVA! SHE'S A STAR DIVA! 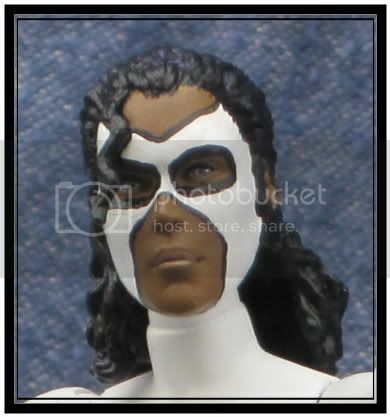 Monica Rambeau was a lieutenant in the New Orleans harbor patrol. 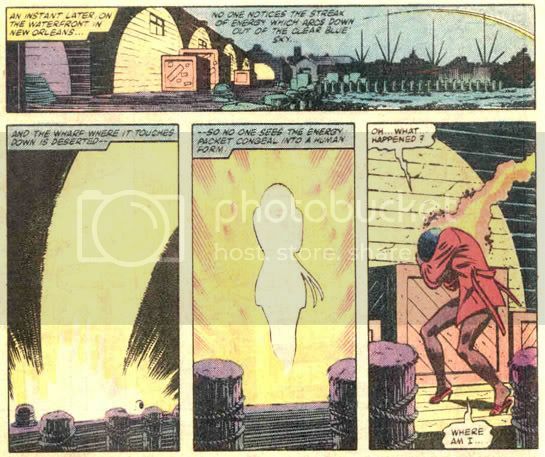 Fate came upon her one day, when she gained super powers after being bombarded by extradimensional energy, produced by an energy disruptor weapon created by a criminal scientist. 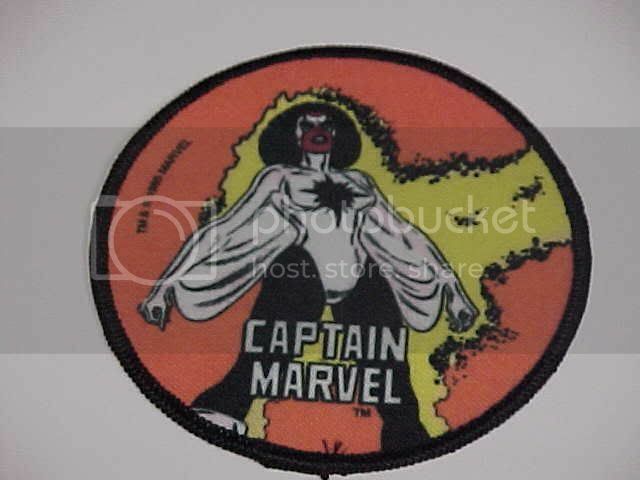 She was originally given the name of Captain Marvel by the media. 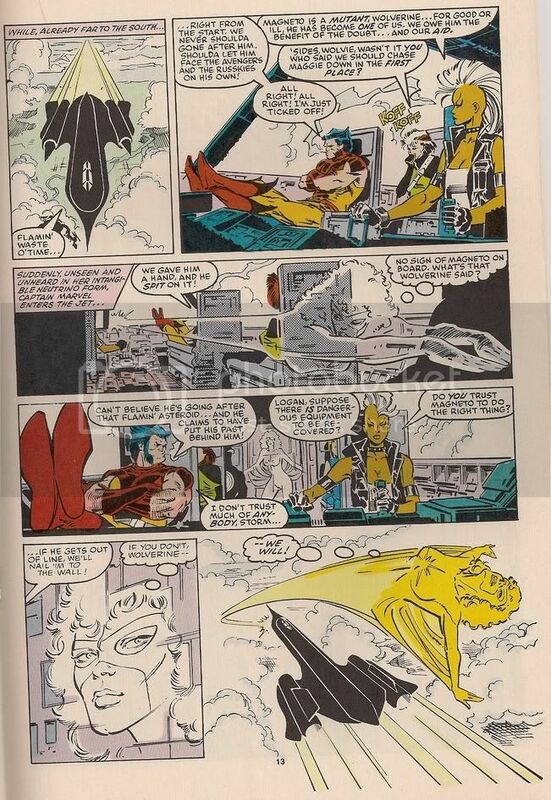 After her initial appearance, Rambeau began experimenting with her powers. Early in her career, she met Spider-Man, who was kind enough to introduce her to the Avengers for additional training. As Captain Marvel, she joined and served in the Avengers. Her membership was a lengthy stint, during which she eventually became the team's leader. Because of injuries, she was forced to leave the active roster. Being off the active roster, she became one of the team's more reliable reservists. Subsequently, she found herself assuming leadership, on two occasions. 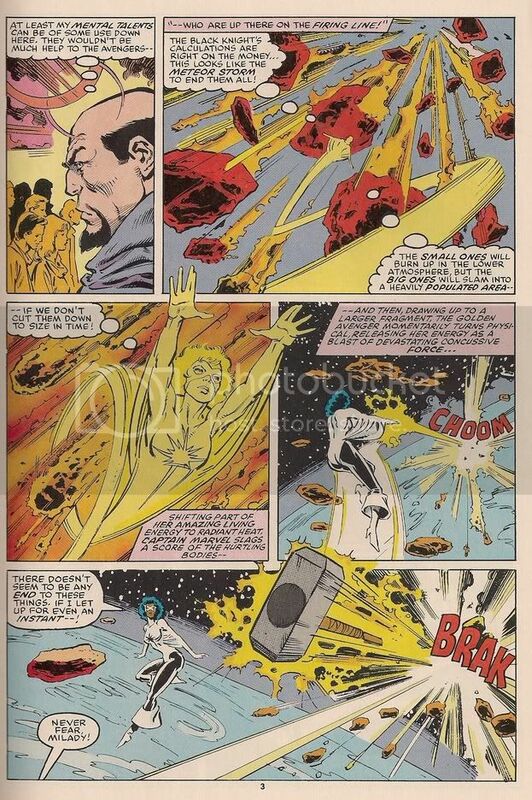 Monica was known as Captain Marvel for most of her Avengers career; however, she agreed to change her alias to Photon, conceding the Captain Marvel title to Genis-Vell, the son of the original Captain Marvel, out of respect for her predecessor. 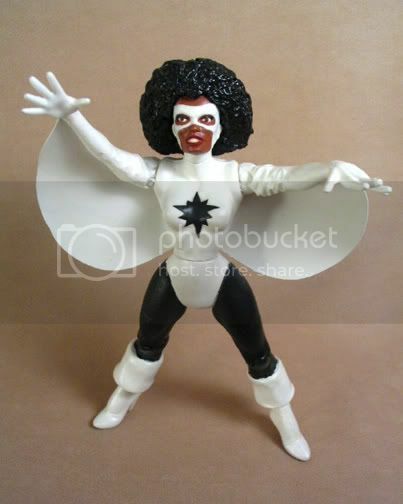 Monica Rambeau was recruited by the Black Panther to fend off a vampire outbreak in post Katrina New Orleans, as part of an all-black super hero team comprising Luke Cage, Blade, Black Panther and Brother Voodoo. Monica was angered upon learning that Genis-Vell has changed his name to Photon upon acquiring new powers. 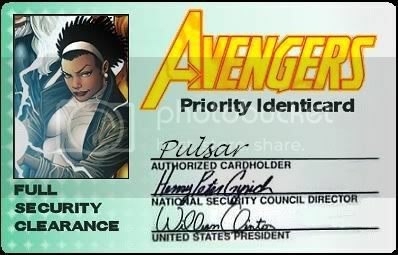 After a talk with him, she contemplated using the new alias of Pulsar. The Highest Anti-Terrorism Effort, or H.A.T.E. 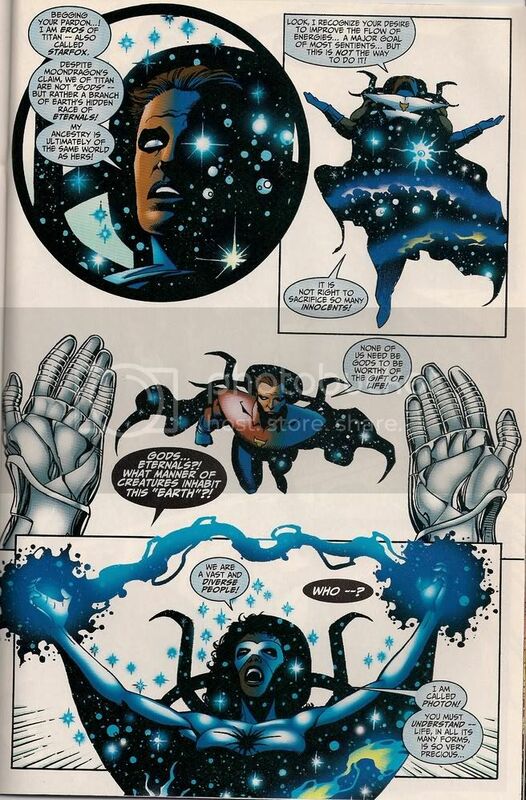 (a subsidiary of the Beyond Corporation) formed a team called Nextwave to fight the Unusual Weapons of Mass Destruction, which Pulsar was leader of. "MONICA'S GONNA MICROWAVE YOUR A**!" 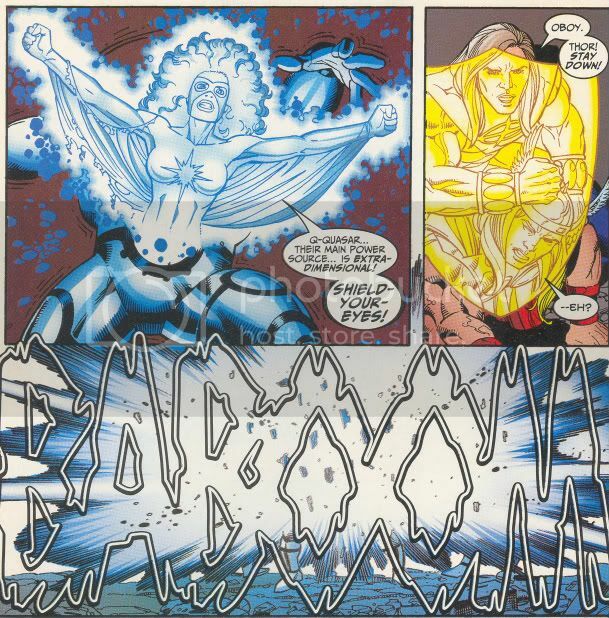 Energy Form: Due to bombardment by extra-dimensional energies, Monica can transform herself into any form of energy within the electromagnetic spectrum. 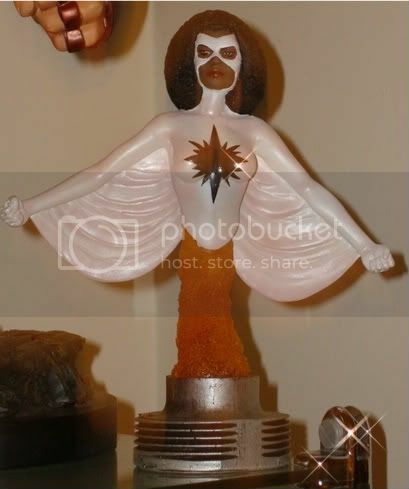 Among the many energy forms she has assumed and is able to control are cosmic rays, gamma rays, X-rays, ultraviolet radiation, visible light, electricity, infrared radiation, microwaves, radio waves and neutrinos. She apparently accomplished this transformation by mentally shunting the matter of her body into the dimension from which she draws her energy and replacing it with a corresponding amount of energy. Her mind remains in the dimension to control the energy-parcel that has taken the place of her body. By assuming an energy-form, she gains all of that energy's properties. Monica is apparently unlimited by the amount of time that she can remain in her energy-form. She can apparently only transform herself into one wavelength of energy at a time, but she can transform between one energy-state and another in a fraction of a second. The amount of energy she can transmit through her body at a given time is not known. Flight: She is capable of flight in any of her energy wavelengths. Superhuman Speed: Monica is capable of moving and reacting at superhuman speeds ranging from the speed of sound to lightspeed. Intagibility: She can phase through solid matter and certain energy fields depending on its wavelength. This also can be done to make herself invulnerable from attack. Invisibility: She is often invisible in most of her forms but can make herself appear visible. Stealth: While in in her invisible light form, Monica can pass through and by anything in a quiet, cautious, and secret or concealed manner to avoid notice. Energy Duplication: When she encounters a new or unfamiliar energy, Monica can often duplicate it given enough time for analysis. Energy Absorption & Manipulation: She is capable of absorbing all energy, as well as absorbing energy from outside sources given her own energy form is at the right wavelength. 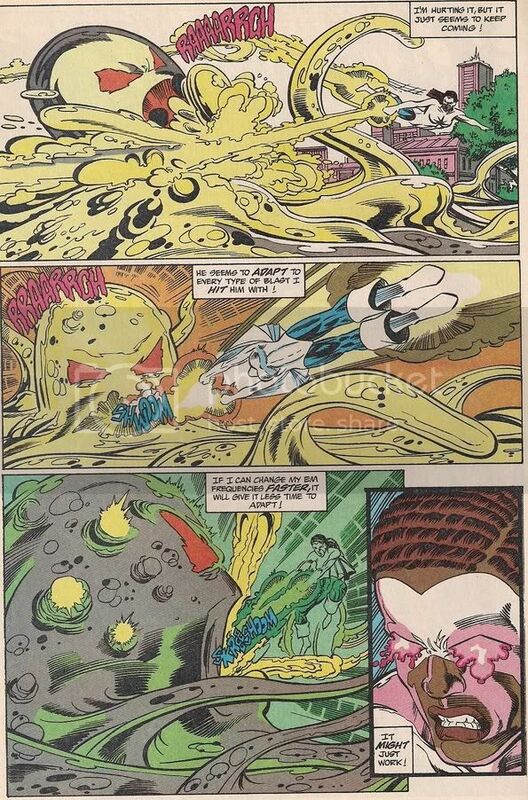 She was even capable of absorbing and manipulating the energies of Kyle Rayner's Green Lantern ring as seen in the Avengers/JLA crossover storyline by matching the energy's specific wavelength. Energy Blasts: Monica has the ability to fire off blasts of whatever energy she becomes and can also emit blasts of any type of energy from any part of her body at once, but normally prefers using her hands for ease of aim. She can also project these energies from her body while she is in human form, usually in the form of energy blasts from her hands. She mentally controls both type and quantity of energy she wishes to transmit. It is not known the maximum amount of energy she can transmit at a given time. Monica can also divert small amounts of various energies for employment as force beams, which have the equivalent to 300 tons of TNT of explosive force. Electronic Interaction & Disruption: She can disrupt and overload electronic devices and opponents with powered armor by passing through them without harming herself. She's also able to communicate via her own radiowaves from earth or outerspace. 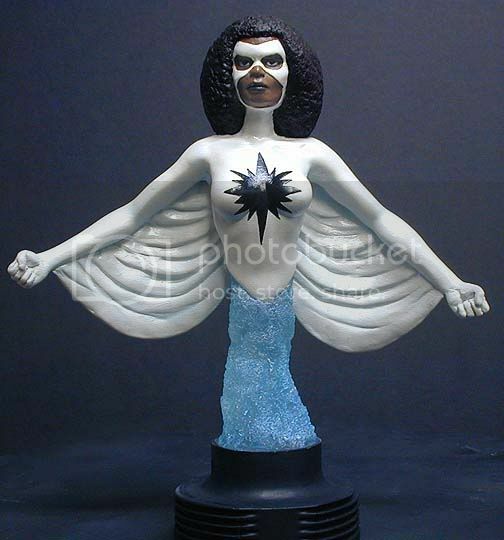 Illusion Casting & Holographic Projection: She has the ability to project light-based holographic illusions. By making objects and others, look altered or creating multiple images of herself. Size Manipulation & Shape Shifting: While in energy form she can reduce her energy to microscopic size and turn back at will, reverting back to her normal size. 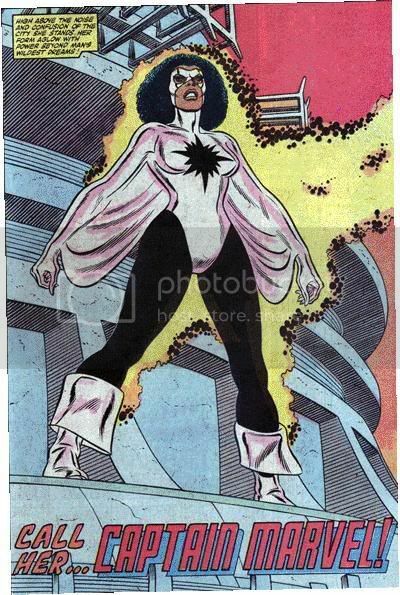 By focusing her light-energy form into a tight beam, she can become a laser and can also split herself into many energy beams of different shapes and sizes. Skilled Leader: Monica has strong leadership skills and law enforcement experience. Monica is a college and police academy graduate. 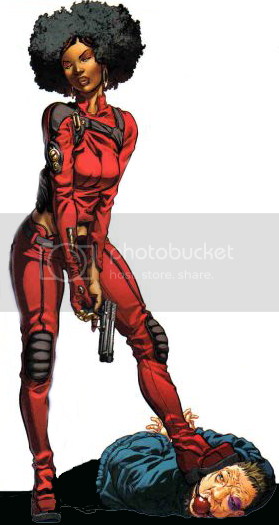 Expert Combatant: She is an excellent markswoman and unarmed combatant due to her law enforcement and Avengers training. She's a skilled detective and strong swimmer. The character was created by Roger Stern and John Romita, Jr., and first appeared in Amazing Spider-Man Annual #16 (1982). 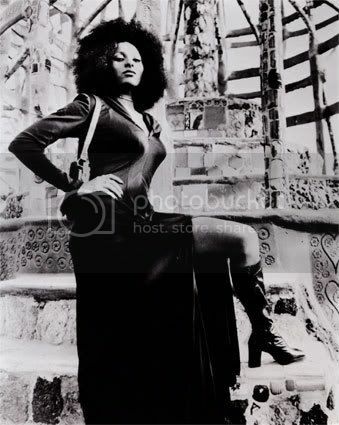 "I just took some reference on Pam Grier, because I always loved her, and at the last moment somebody said that, "well, we need to use this woman, here," because they thought maybe Pam Grier wasn't as good looking as the model they found. It was fine, because by the time she got done by other artists, it ended up looking like the generic black character, anyway." MONICA BECOMES THE SUPERHERO CAPTAIN MARVEL II! Pulsar flying near the surface of the sun, she seems to feel at home there..lol. Even Rogue the southern power thief seems shook at the sheer light speed of Monica. Pulsar flying in space hitting the surface of the moon and within seconds she's back on earth. Storm remarks that Monica is all over the place. Monica's so fast that she leaves the other heroes forzen in place. 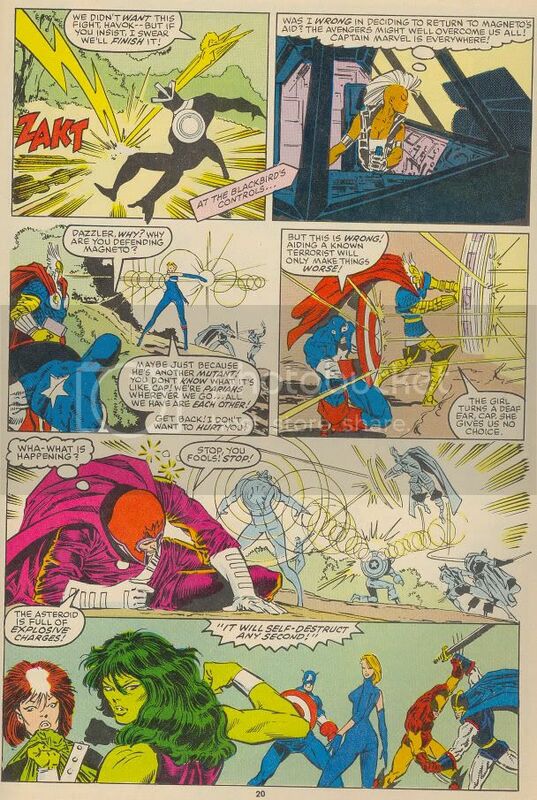 Pulsar shows Quicksilver that he comes in last place when it comes to speed blitzing. God that was a good run on Avengers...I miss it. Also, I can't call her anything but Captain Marvel. 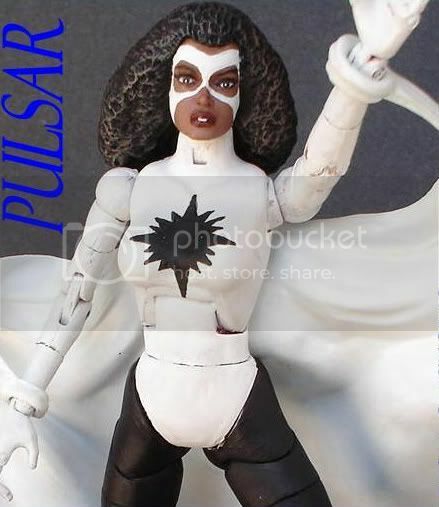 Pulsar shrinks down to atom size to assist King T'Challa. 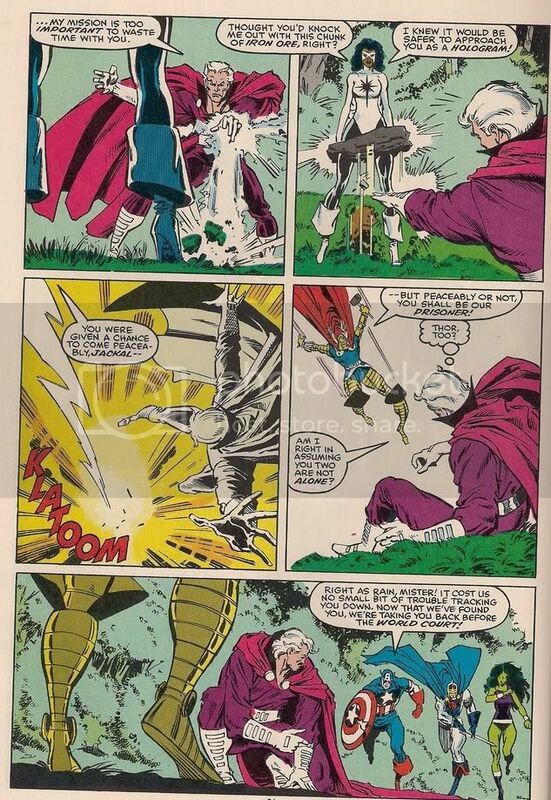 Baron Zemo and Magneto gets a taste of Pulsar's holographic and phasing powers. 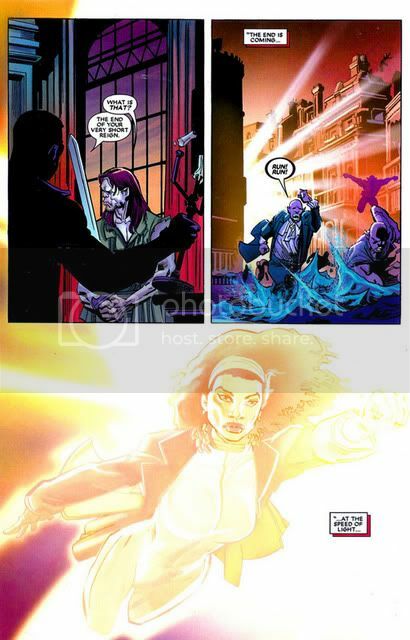 She also heats things up for Zemo! there is NO bigger and better fan on this planet than you, Tah. Thanks eking! I've been meaning to start a respect thread, but my scanner was down. I got a new one 4 christmas. Yay! She's capable of sneaking on board the X-men's Blackbird jet unseen and unheard. 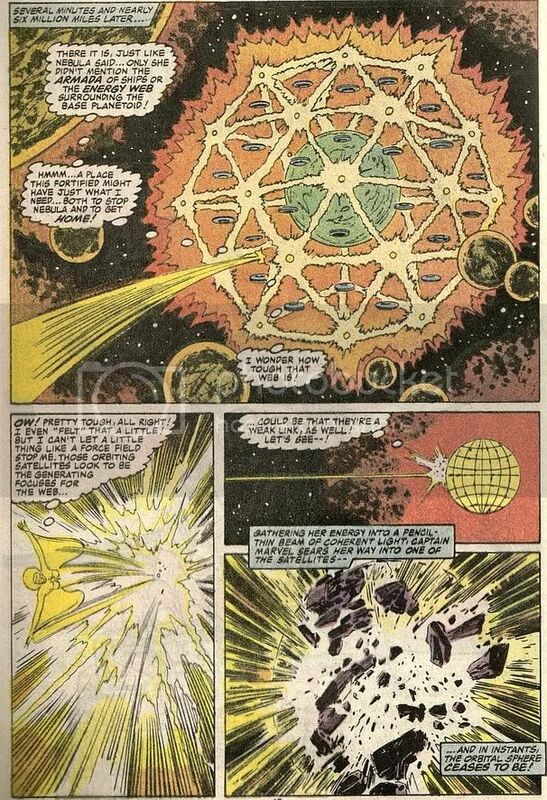 Pulsar changes her light frequency to enter Magneto's magnetic shield to attack him! 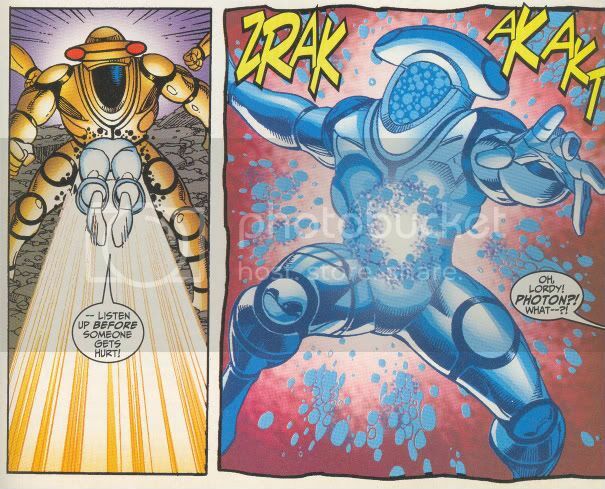 The golden girl becomes radiant heat and uses concussive force blast to ward off a bombardment from a meteor storm. 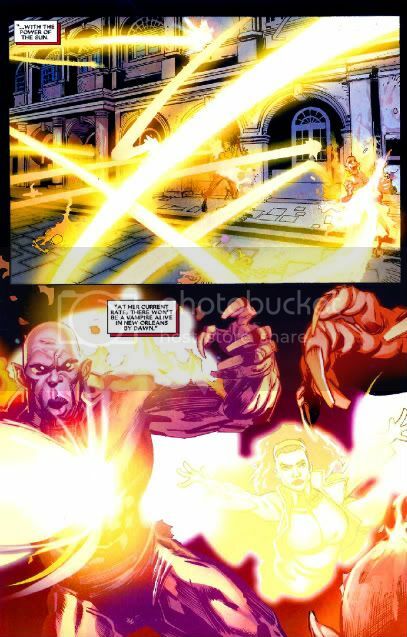 She destroys a world-wide force field by becoming a coherent beam of light. She eliminates a horde of vampires! She attemps 2 repair a sinking ship by shifting into heat. She becomes electricity and overloads Crimson Dynamo. 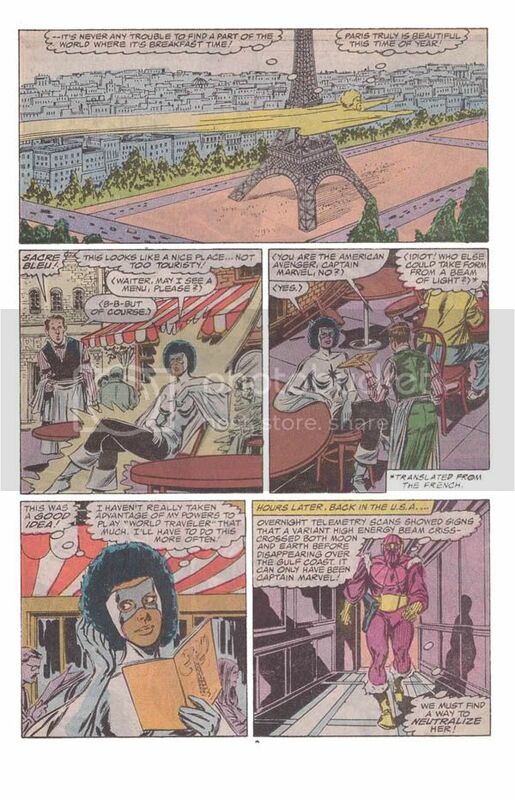 cool...read some of her adventures back in the 80s but never knew all these details.....used to read Avengers when Roger Stern wrote it way back in the day. She is able to shift through her energies fast enough to overpower the Killing Machine! 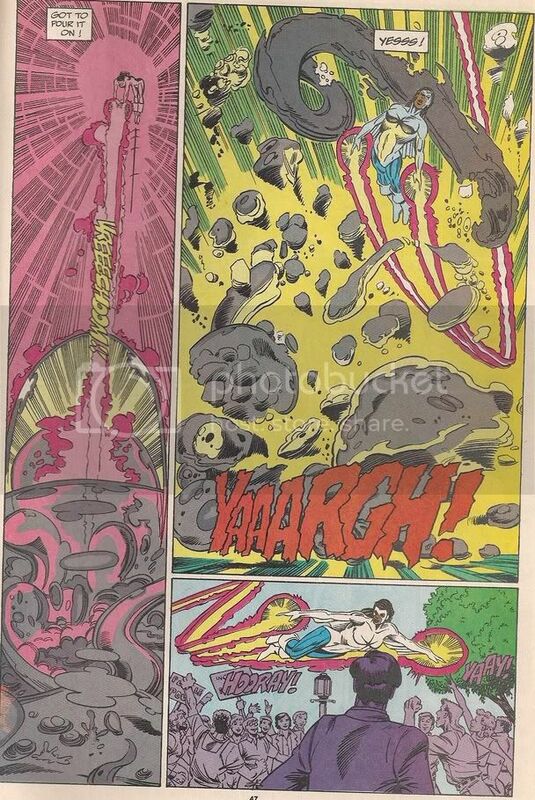 She phases into a Servitor robot, absorbing and draining it's extra dimensional energies, ultimately causing an explosion destroying it completely. She was one of the heroes that ETERNITY THE LIVING EMBODIMENT, merged with to reason with the Infinites. I remember that page[image] above this remark. 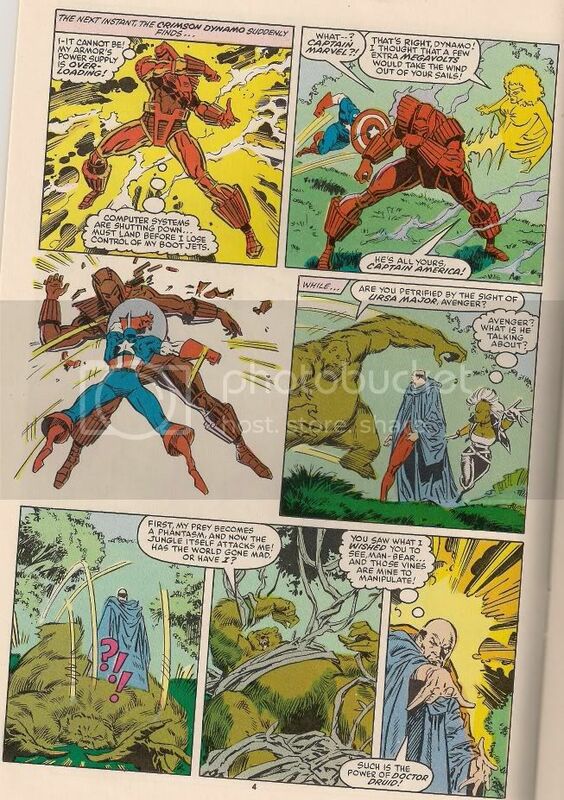 This was from the issue that had an event crossed over between two titles, Fantastic Four & Avengers. 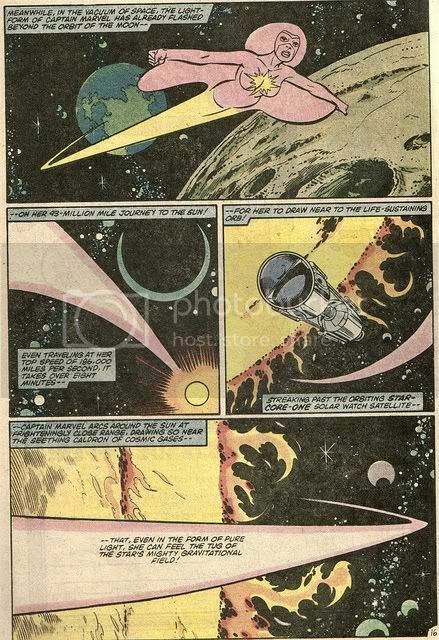 I think it was a invisible barrier that was expanding from the negative zone into earth realm caused by I-forget-the-creature's-name-with-wings. The reason I picked this book up was only because She-Hulk was in it. She was was using brute strength to slow the barrier's expansion and I remember the villain of the story actually being impressed by her. The black female[I think her name was Capt. 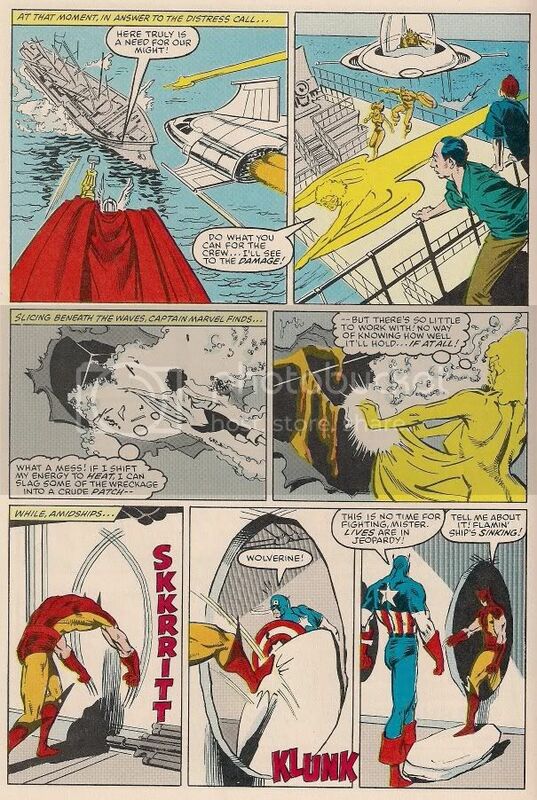 Marvel at the time] was leader of the Avengers. 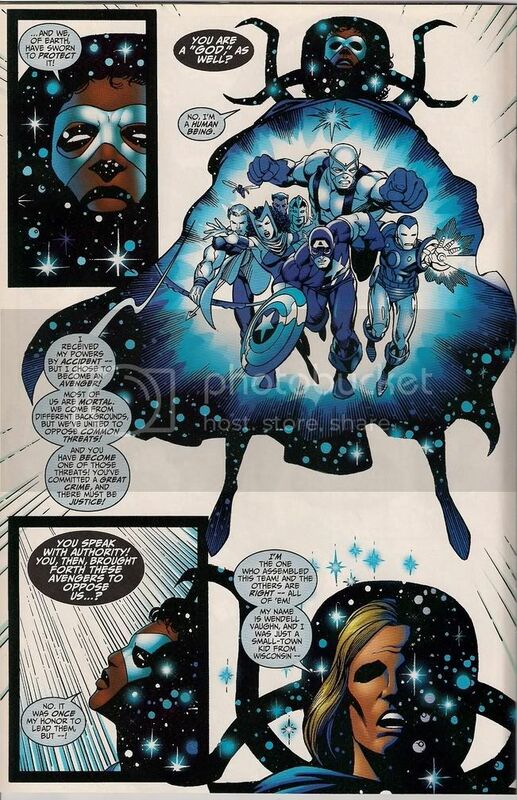 I remember thinking back then, "Oh Schitt...A black female hero in charge of the Avengers?! That's gangsta!" 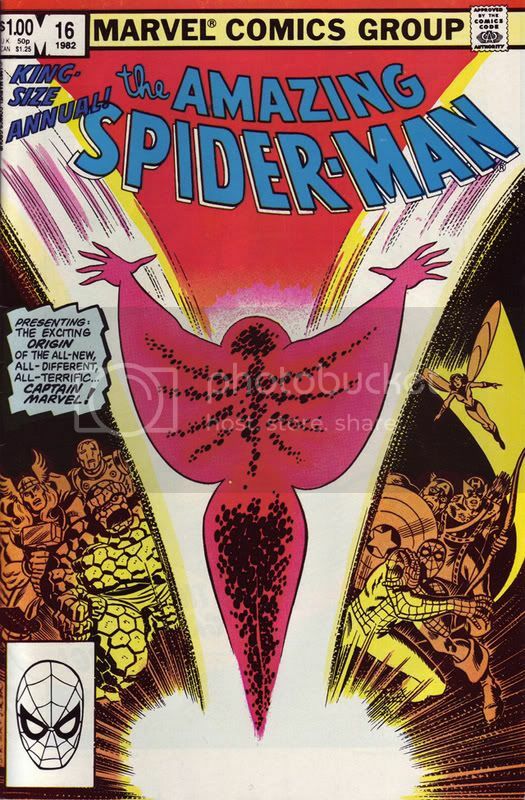 ...which made me pick up another Avengers book [drawn by the late, great John Buscema, inked by Tom Palmer]but by that time, I had no more interest in reading any comicbooks. 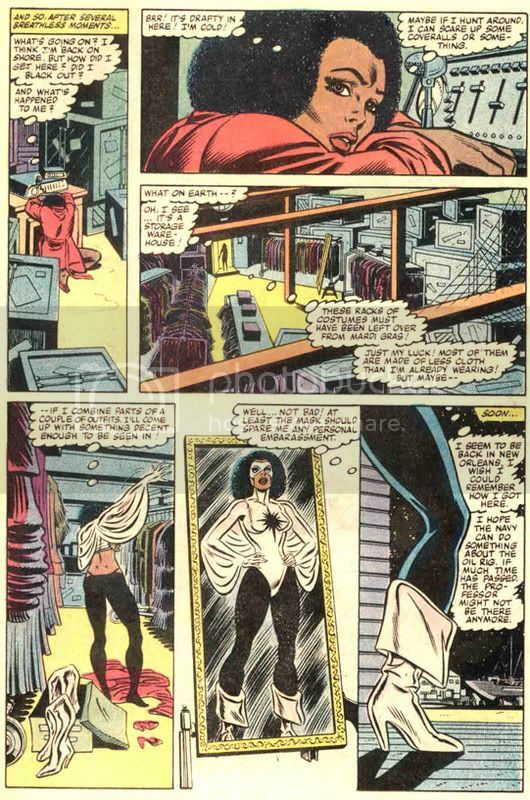 Looking at those other pages you posted, Ms. Digga, made me wish I had stuck with it a little while longer as I really liked Buscema's panels and some of those funny confrontations between She-Hulk and Capt. Marvel. 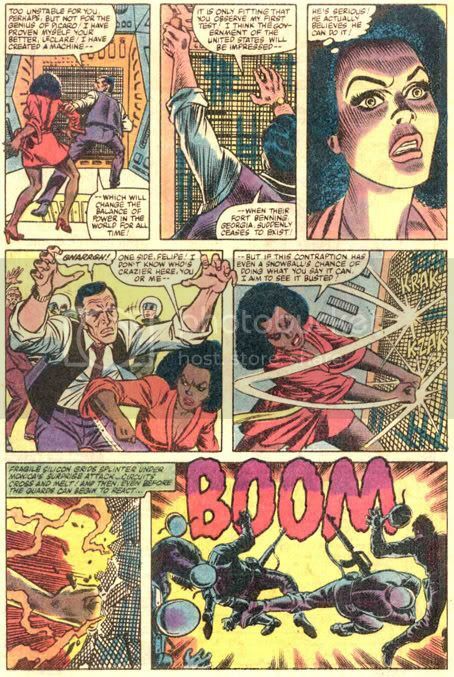 Looking at those other pages you posted, Ms. Digga, made me wish I had stuck with it a little while longer as I really liked Buscema's panels and some of those funny confrontations between She-Hulk and Capt. Marvel. I really was one of the best runs on the Avengers and is one of my favorite runs on any book. Heck, Roger Stern made Dr. Druid one of my favorite characters. You heard me correctly, DR. DRUID!